Are you a student looking for summer research experience? 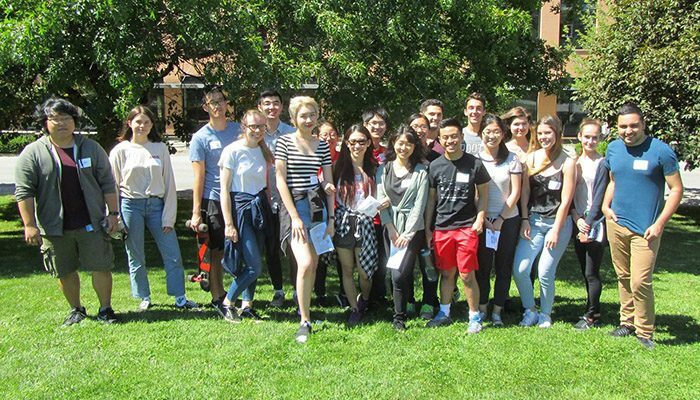 The Centre for Blood Research-School of Biomedical Engineering (CBR-SBME) Summer Studentship Program provides students with an opportunity to get hands-on lab experience during the summer months and to present their research at the CBR Research Day. This program also enhances our summer students’ learning with research skills workshops, tours of campus facilities, and complementary social events. CBR Principal Investigators, Postdoctoral Fellows, and Research Associates can apply to supervise a summer student. Annual deadline for application is April 1. Competition for the 2019 CBR-SBME Summer Studentship Program is now closed. If you are a PDF/RA, download the CBR-SBME PDF/RA Summer Studentship Application 2019. If you are a PI, download the CBR-SBME PI Summer Studentship Application 2019. Contact a CBR or SBME Principal Investigator, Postdoctoral Fellow, or Research Associate you are interested in working with. It is good practice to send them your CV, cover letter and/or statement of interest. Submit your CV and letter of interest by March 15 to Stefanie Mak (Education Program Manager; stefanie.mak@ubc.ca). The letter of interest should describe your relevant accomplishments, interests, and career goals. Maximum length for CV is 2 pages and for letter of interest is 1 page. *Note: Most summer students are hired through contacting PIs, PDFs, or RAs directly. Only a small proportion get in through a general application. Out-of-town students are welcome to apply. It is the student’s responsibility to find housing for the duration of the program. Details about the 2019 CBR-SBME Summer Studentship Program schedule will be released shortly. Click here to view last year’s program schedule.